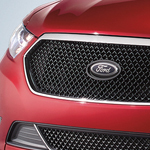 When you think Ford Taurus and full-size sedan, you now have to think technology features. Here are a few of those features drivers are excited to discover. There may come a time when you drift out of the car lane because you are tired or possibly distracted, so the Lane-Keeping System in the Taurus is there to help. When your car rides over the lane lines, the steering wheel starts to vibrate to give you time to focus and get back control of the vehicle before an accident occurs. Now when you are driving on the highway, you'll certainly appreciate the Blind Spot Information System of the Taurus. This system keeps monitoring the blind spots on either side of the vehicle, and if any vehicle appears, you are alerted to stay out of that lane unit it clears. The new Ford Focus is here on our lot at Frontier Ford ready for you to test drive.